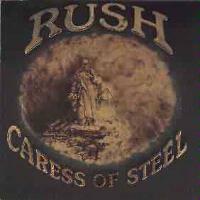 Caress of Steel was sort of a crossroads for Rush, taking them from their more metal beginnings into the progressive directions that would characterize the next phase of their career. Much of this album is quite metallic, but with many strong prog leanings, hence the inclusion as prog metal. Rush is Geddy Lee, Alex Lifeson and Neil Peart. Another straight-ahead metallic rocker, this one addressing growing old gracefully. The narrator laments many of the problems of his fading youth, concluding in the end that "even when I`m gray, I`ll still be gray my way." Throughout this cut, there are various monologues presented as spoken word narration in a heavily processed voice. This is a fantasy tale nearly cut from the works of such authors as Tolkein and Howard. The track is a near masterpiece, taking metallic tones and using them in very progish ways with a progressive rock arrangement. The first section of the piece is entitled "Into the Darkness". The second movement, "Under the Shadow", is very metallic combining a nicely unusual rhythm with strong metal guitar tones, and includes a powerful and inspired jam. "Return of the Prince", part III, finishes the tale in modes that fit well with the earlier tones of the composition, bringing it to a quite satisfying conclusion. An epic tale, also in a fantasy setting, that focuses on personal quests. This piece is very progressive rock oriented, but still exhibits strong metallic elements. The movements of the composition ("In The Valley", "Didacts and Narpets", "No One At The Bridge", "Panacea", "Bacchus Plateau", and "The Fountain") encompass many musical styles from metallic power to balladic beauty, prog wonder and chaotic cacophony. The lyrics tell a story of a man following an arduous and perilous quest to find a fountain on a mountain. Upon reaching the fountain, it is a bit of a let down and he is "tired out of breath." He realizes that achieving his goal is not nearly as important as having a goal. "Many journeys end here, But the secret`s all the same, Life is just a candle, And the dream must give it flame."